I was walking in JoAnn’s headed for the yarn aisle, when this gorgeous black, white and gray colorway of the Woolspun Yarn caught my eye as it sat at the end of the button aisle. Immediately, I had to stop, and pick it up, and rub it against my face (that’s a thing!). I had never used this yarn before, but I was in love with the colorway, the thickness, and the warm, plushy feeling. I bought four skeins of it not knowing what I would do with it. I tried cables and ripples, and even a little basic knitting with this yarn, but these just didn’t seem to be the right fit for this colorway, so I listened, and I decided to go with a nice, basic half double crochet stitch pattern to allow the busy colorway to be the star of the show. 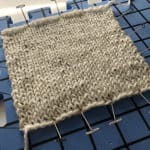 I went a little further, and worked the half double crochet rounds with a turn so it would: number one – avoid a traveling seam, but also number two – to create a little extra texture, which I love! As a “star of the show” piece, what better than an accessory? I have made two other shoulder cozies in the last two years, and I love wearing them over a long sleeve shirt. The cozy covers just enough without restricting arm movement, and I can pull my arms up into the cozy if they get cold. 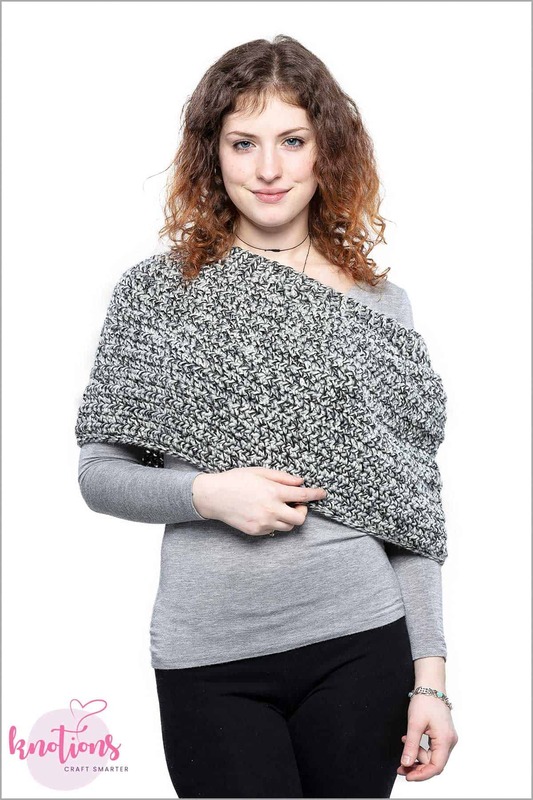 This cozy is worked from the bottom up, ending with some decreases to hug you just above your shoulders so you can wear it with ease and comfort, but if you don’t like that, you can continue without the decreases and hook size to create a cozy you can wear a little further down your arms to show off your shoulders. Imagine this cozy over a basic long sleeve shirt paired with your favorite pair of blue jeans, or how about over a minty green dress with a pair of little black booties?! You’ll be ready for a casual day around town, or date night! 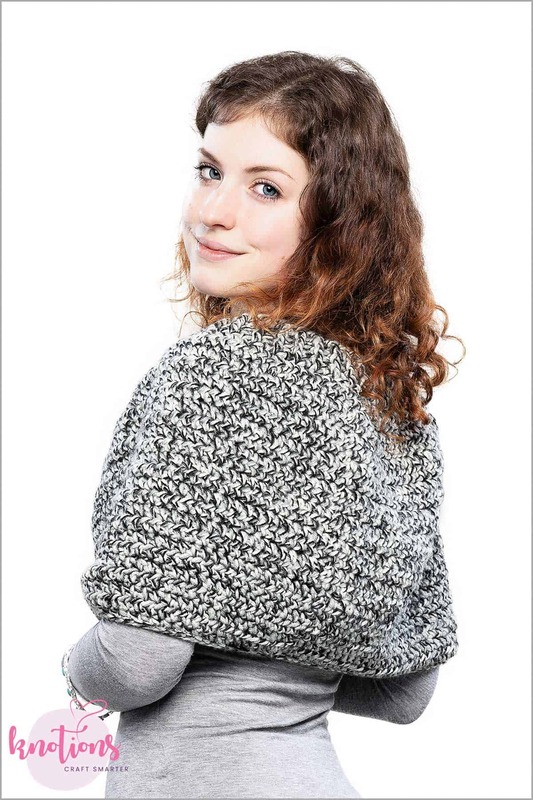 Cozy is designed with 2” of negative ease – this means, for example, the size medium will have a finished circumference (before ribbing) of 46”. 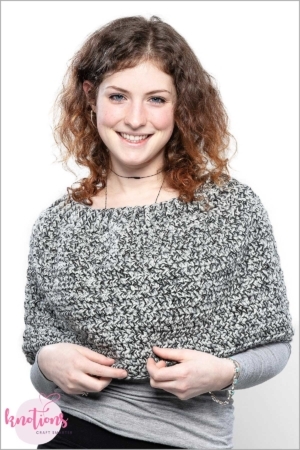 I did some polling to check the length of this cozy in the larger size, and the given length seems to be pretty standard, but if you want more coverage, simply add more repeats of the half double crochet round before you begin the decreases, and ribbing area. The foundation chain 3, and the beginning chain 2 starting in round 24 are the only beginning chains that count as stitches. 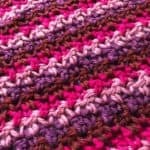 The top of the cozy is designed to hug the shoulders, but if a straight wrap is desired, simply work round 23 as another round of half double crochet, and then continue as written. If a longer cozy is desired, simply add more rounds of the half double crochet repeat. 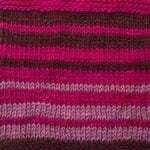 Keep in mind that the ribbing adds 2.13” to cozy length. 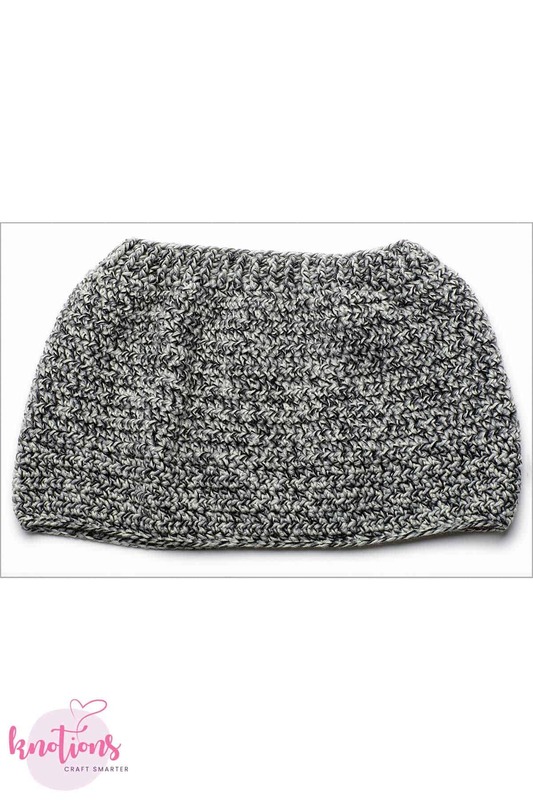 It’s recommended you try the piece on before fastening off to make sure the cozy fits the way you like. Rnd 2 – 22: Ch 1, and turn. Hdc into the 1st st, and ea st around. Join. R24 All Sizes: Switch to K hook. Ch 2. DC into the 2nd sc, and around. Join. R25 – 27: Ch 2. Fpdc around the next post, *bpdc around the next post, fpdc around the next post, rep from * around. Join. Alexandra is described as a “craft, coffee and cat addict”. She began her crafting journey more than 10 years ago with needlepoint on plastic canvas. Four years ago she jumped head first into crocheting and jewelry making, and her blogging journey as EyeLoveKnots, named in honor of family members affected by Retinoblastoma – a cancer of the eye. She can also be found on her sister blog, EyeLoveCrafts, where she is working on building a directory of recipes along with jewelry, home decor, yarn related and sewing tutorials. 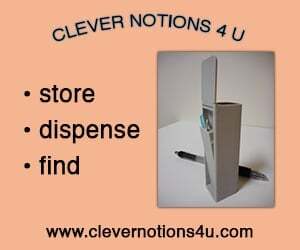 That’s really sweet, perfect for in-between weather! 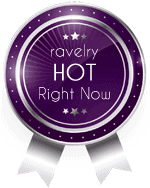 It’s lovely, thank you for sharing the pattern at The Really Crafty Link Party. Pinned.